Einstein the brainy dachshund, Puzzle the snoozy sheepdog and Bounce the springer spaniel spend their holidays at a very special kind of kennels – a lighthouse by the sea! 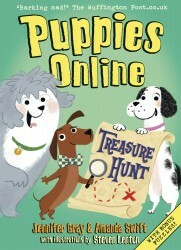 In their very first adventure, this woof-tastic trio encounter the dastardly Mike Dodger, discover an ancient treasure map and find themselves caught up in a race against time! The first in a brand new animal adventure series from the authors of the much-loved Guinea Pigs Online, illustrated by Steven Lenton.